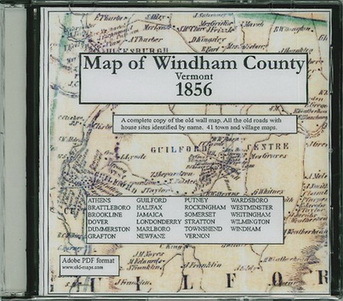 A complete reproduction of "McClellan's Map of Windham County, Vermont" on a CD-ROM. The 1856 map (the original is a large wall map) provides us with the earliest comprehensive view of who lived where in the 23 towns of Windham County. More than 5000 home sites are located and named. A complete alphabetical index to names is supplied with this edition.